Life's little details...: I've been scrapping!!! More from Vintage Finds! I cannot seem to get enough of this collection. I love it! Plain and simple! 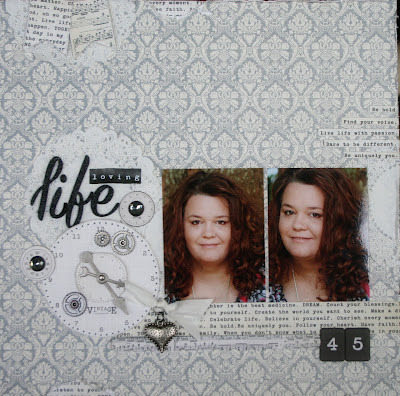 I decided I needed to do a layout featuring me because I am never in any pictures. Always the one behind the camera as I am sure most of you are too. I think it will be important to our families if we include ourselves every once in a while, wink. In the closeup you can see that I cut some of the clocks out from the clock paper and layered them. 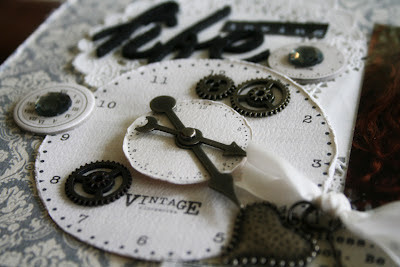 I added some Tim Holtz gears and game spinners to add some fun. Well, I am off to scrap...going to work on the mini that has been running through my mind. It won't let me sleep. Maybe if I get started on it, my mind will settle for tonight! i love love love this. LOVE it. but i have TWO suggestions... that picture does NOT reflect your current victory.. you need new pictures that reflect your new 'you'! and... you need to JOURNAL what you blogged.